Tango as a therapy is based on the practice of ” Tango Salón “. it is used to treat symptoms of Alzheimer’s and Parkinson’s disease, of heart disorders and mental health problems. Tango is also used as couples therapy, to help rebuild the couple’s relationship. Thus tango is recognized as an innovative therapy in various fields of physical and mental health. One of the characteristics of tango is the embrace, a way to hold to another person which is not as superficial as in other dances. According to Dr. Trossero, one of the pioneers of tango therapy, the embrace has a positive effect against symptoms caused by excessive stress. Just as massage or laying on of hands provide a feeling of well-being and security which can even make the patient fall asleep, the embrace while dancing tango is a contact form making people feel secure, a key aspect which has therapeutic virtues. This effect is produced by a hormone called oxytocin, which acts in various ways, one of them being that it slows down the release of another hormone, called corticotropin (CRH ), which causes stress. These effects also result in tranquillity and a sense of happiness, which contribute to the prevention of disorders caused by stress, such as hypertension, heart attacks, etc. We have already mentioned the importance of walking in the “Tango Salón” style. In tango therapy a lot of emphasis is also put on walking. Aerobic activities are recommended for people with heart problems, hypertension or diabetes. For these people, tango is a form of sports therapy. In Buenos Aires, in some hospitals specialized in the treatment of heart diseases, free tango classes and milongas with orchestra are organized for patients. Puppy Castello, one of the old ” Milongueros maestros ” of Buenos Aires, who suffered from the disease, helped understanding the effects of tango on Parkinson’s disease. He pointed to his doctor that when dancing, his body was no longer trembling. In Buenos Aires , patients who practice tango therapy are first asked to perform warm-up movements so that the rigidity of their muscles and their body tremors can give way to fluid motion. Then they start dancing with a companion or a member of their family. The quality of the embrace doesn’t matter at that stage, the key is that the patient feels his body axis and the weight transfers. He’s then able to prevent any loss of balance and can react instantly. 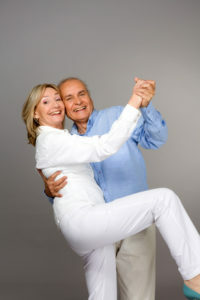 Furthermore, by synchronizing with a dance partner, patients get to walk. For people who find it hard to move on their own, tango is a safer sports therapy because they don’t walking alone. 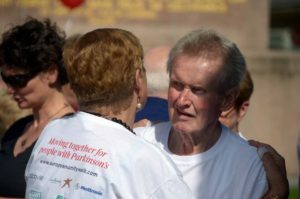 People with Parkinson’s disease also have trouble coordinating more than two or three movements, something which is often required in daily life. Unlike other therapies based on dance, which use large movements, tango requires movements of reduced amplitude, but occurring in different parts of the body. In tango therapy, people have to do different little movements at the same time, just as in everyday life, but with the support of music. Tango dancers learn steps and improvise. While dancing tango, patients with Alzheimer’s disease have to remember and execute steps. The practice of tango also has a positive impact on their morale, which is in turn good for their well-being as the symptoms are weaker when patients feel well. The relationship based on trust which is established between the patient and the accompanying dancer also has a beneficial effect. Tango as a therapy is used in different contexts; however, the key aspect is that through tango you will feel more self-confident, more secure and you will gain more self-esteem. People having health problems may tend to lose self-confidence and get depressed. Tango offers them the opportunity to go out, to socialize and to forget their problems for a while. The need to synchronize with another person has a positive impact on morale. Tango is a dance which also positively reinforces self-esteem. If you have health problems, do not hesitate to come and speak with us, we’ll do our best with passion and sincerity to help you live better.